I’ve put together a selection here of beautiful Vintage Sailor Boy Images! 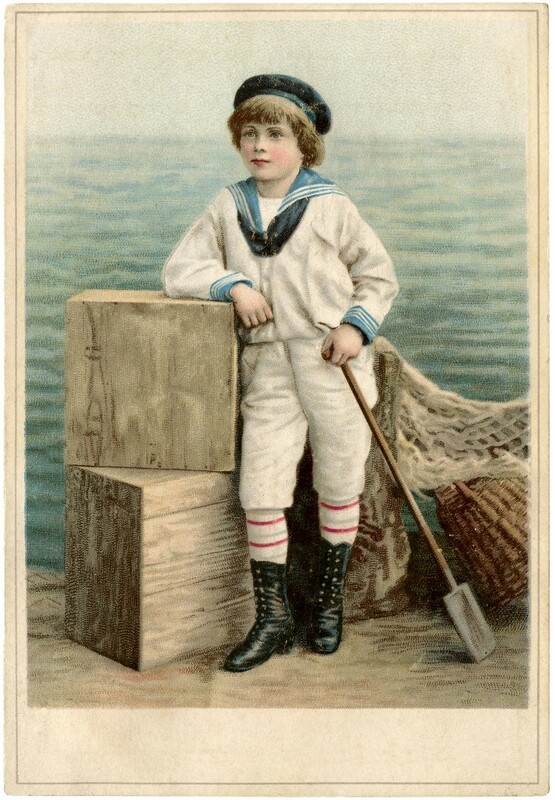 These darling Boys are wearing classic Victorian Sailor Suits and all are full color Vintage Images. These would be great to use in Coastal themed projects or Crafts. Great to tuck into a Beach themed Junk Journal or Travel Journal as well. I hope you enjoy these Vintage Sailor Pictures. I’m sharing another one of these cuties today. 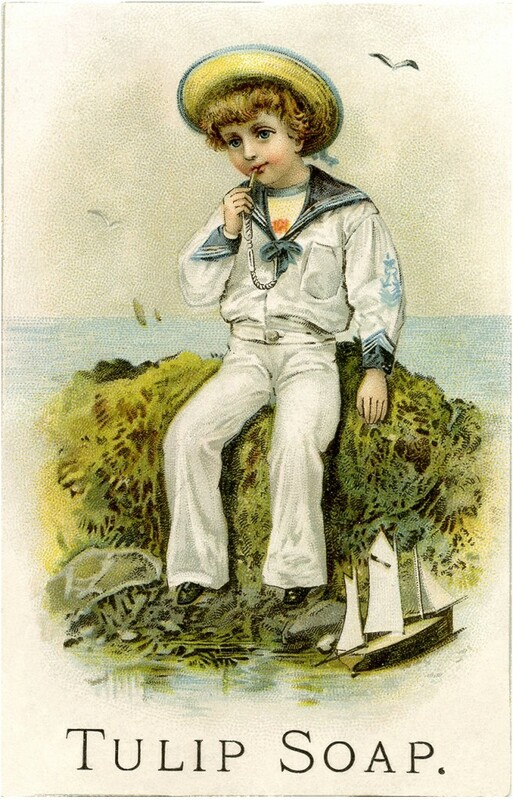 This is a Gorgeous Vintage Sailor Boy Image! This cute little boy is wearing a Gray Suit with matching Hat. He’s holding a little Toy Sailboat! 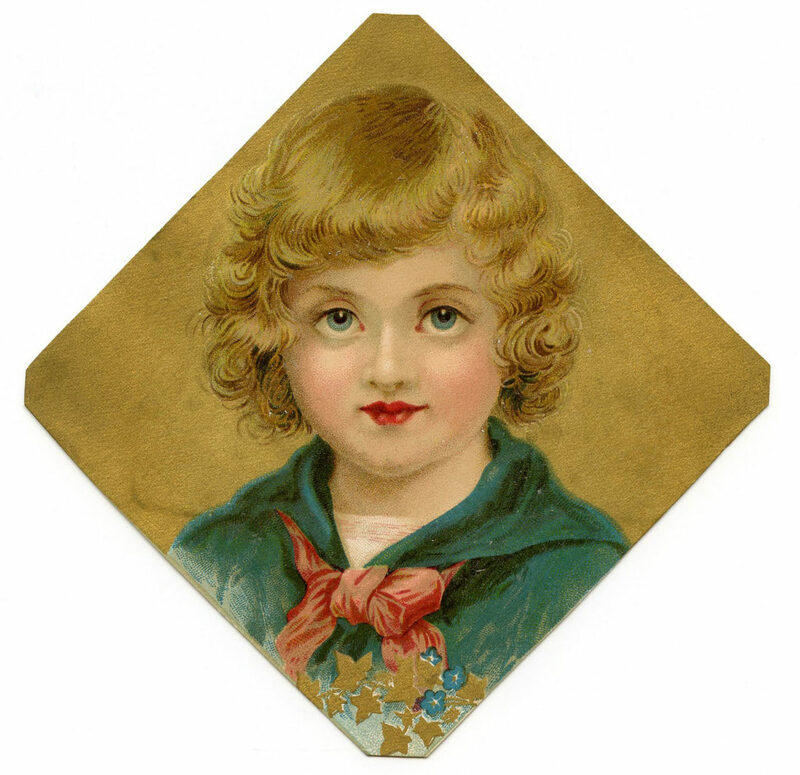 This little diamond shaped card features a darling Victorian Sailor Boy! His face and eyes are so beautiful. And the colors are great too, I love the contrast of his red tie with his blue suit. The suit matches his Blue Eyes perfectly. 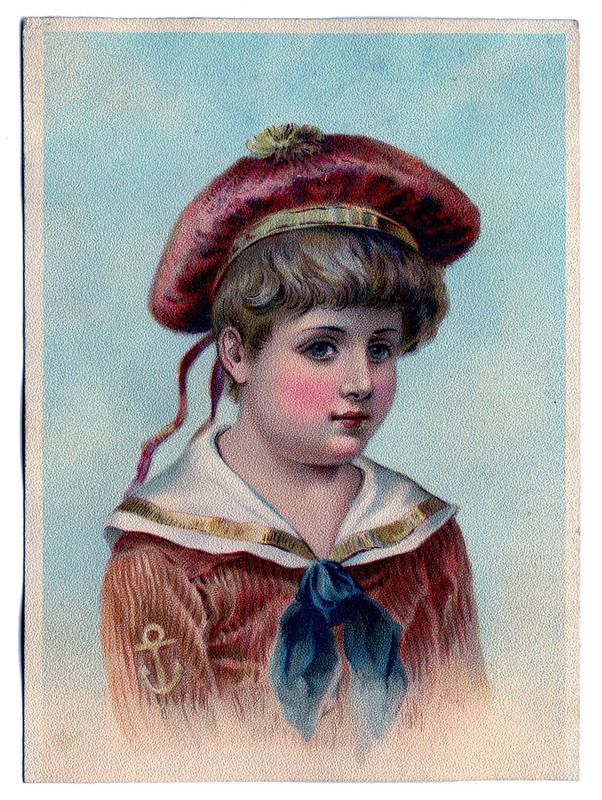 This is a wonderful Victorian card, featuring a darling pink cheeked boy! He’s wearing a red suit, that looks as if it’s made of corduroy. The suit has a large white collar trimmed with Gold and a Navy Blue Tie. He’s wearing a matching hat with a little pompom on top. Doesn’t he have a beautiful face?! This is a Victorian Trade Card for Tulip Soap. 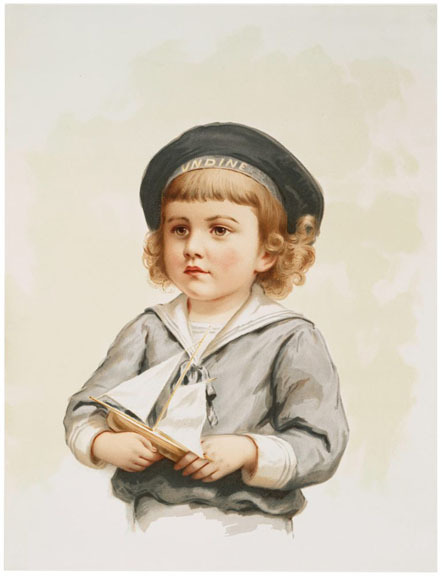 I purchased this as a set of 4, each one shows an adorable little boy in a Sailor Suit. This first one shows our sweet child fishing on a peer. It looks like he’s caught a couple of fish already! He looks quite sharp in his White Suit with blue collar and his Straw Hat. This is the second one in the series. 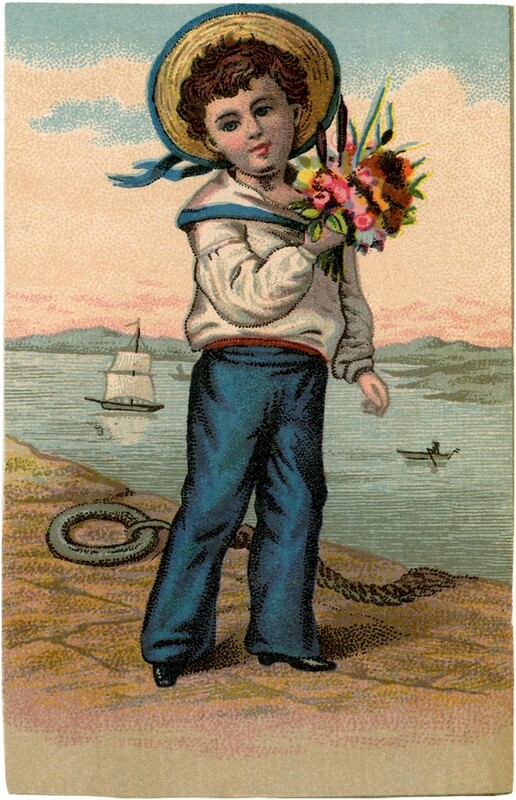 This charming child appears to be getting ready to go out in his fishing boat. He has some type of trap behind him and he’s holding a telescope. He’s sporting a classic double breasted Sailor Suit with a Navy Beret. Our next little Lad appears to be sitting on a bed of Kelp! I would not think that would be very comfortable. He’s got his toy Sailboat with him and a shiny metal whistle. Our last boy in this series, also has a toy Sailboat. 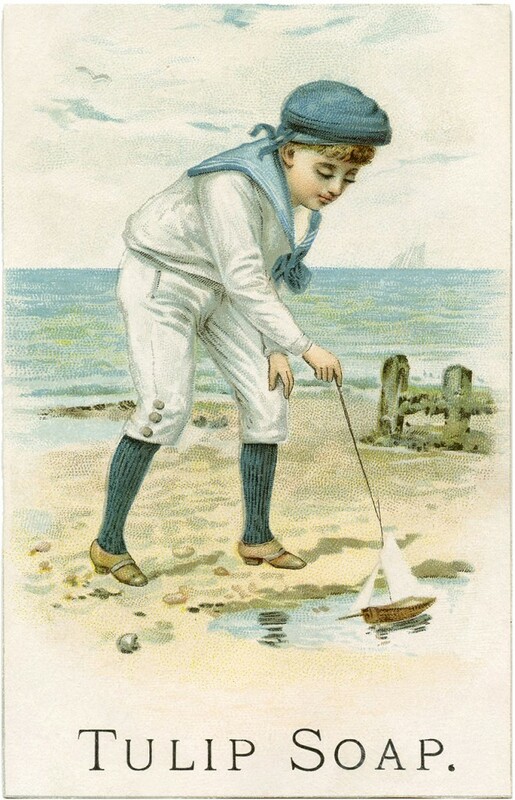 He’s found a little tide pool on the beach to sail his boat in. Looks like a fun day at the Sea! Click HERE to see how one reader used this image to create a charming Coastal Themed Card. This cute young Boy is not a part of the series above, but he has a similar style to him. He’s carrying a bouquet, perhaps it’s for his sweetheart. This is an Antique Trade Card, probably used as an old Advertisement, although I didn’t find any writing on it. It’s such a realistic looking picture, that it almost looks like a photo! This card shows an adorable little Boy dressed in a White Suit. I love his striped socks! 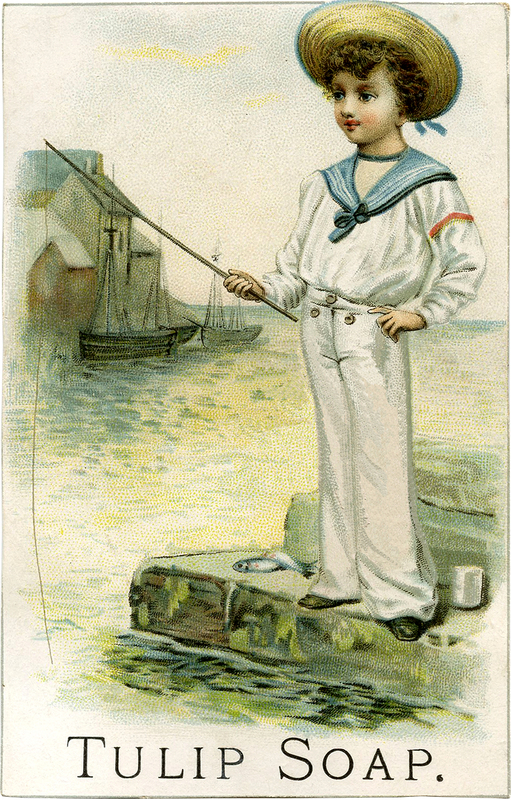 He appears to be standing on a Dock, with an Oar in hand, with the Ocean waves behind him. The colors are so vibrant and lovely on this Image. This is an unusual looking Victorian Card! 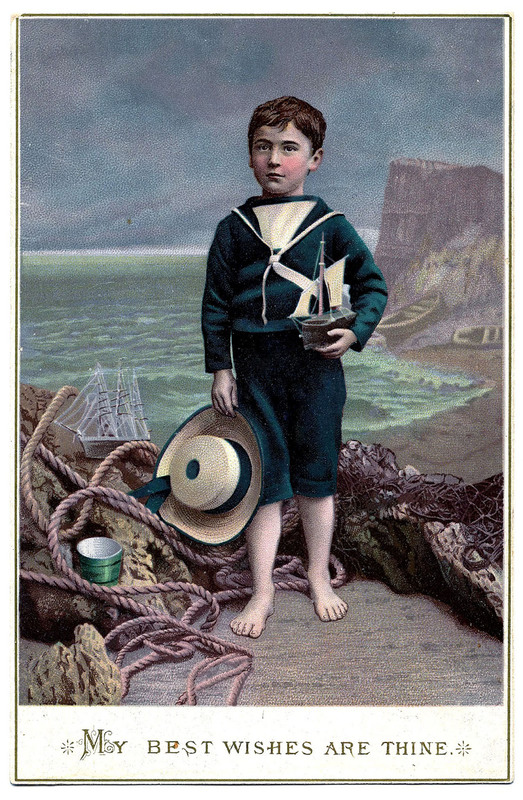 The card shows a little Boy in a Navy blue Nautical Suit… by the Sea. He’s holding a Toy Boat and a Straw Hat. None of that is unusual really, but it’s the Dream like appearance of the scene that is so different looking. This one really draws you in and makes you wonder… or at least that’s how I feel when I look at it! As if something magical were about to happen! This is a Delightful Child in a Heart Graphic! 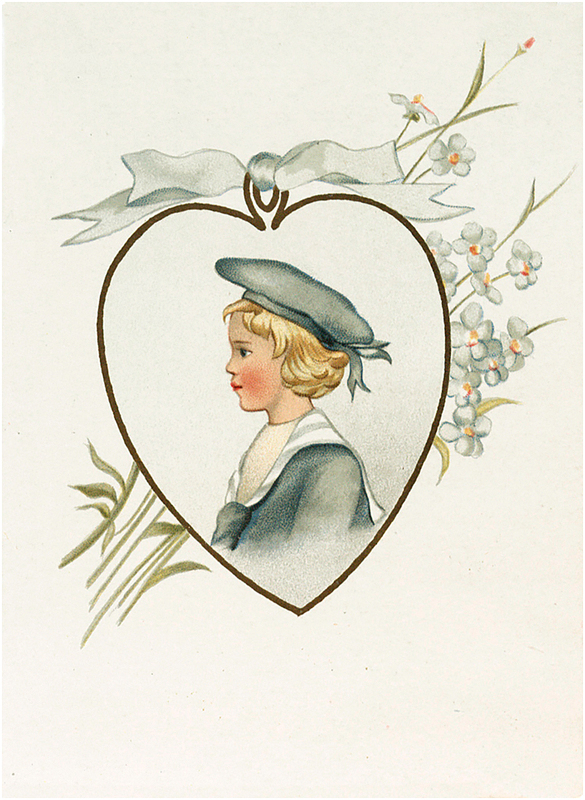 A heart hanging from a dusty blue bow frames a side portrait of a cute child in a dusty blue suit and cap. A spray of white flowers stretches behind the heart. Adorable Boy Surrounded by Birds Image! 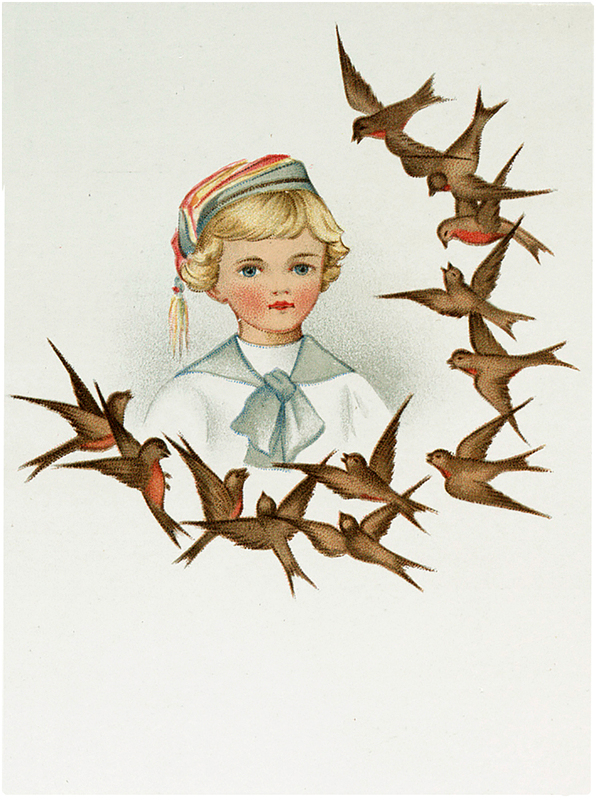 Brown birds with red chests surround an adorable blond Sailor boy. His tie is a light dusty green-blue color and the cap is the same green with red and yellow stripes and a gold tassel hanging off the side. 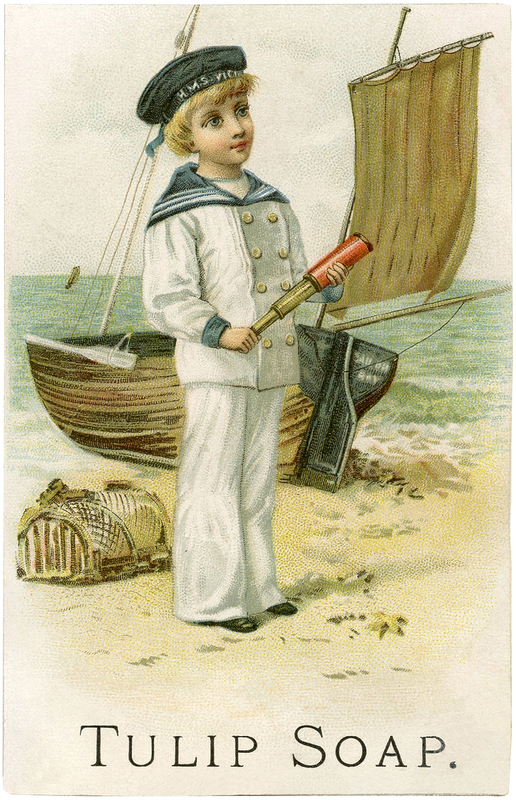 I hope you enjoyed this Nautical themed image collection of children. You might also like our Black and White Sailor Boys (and Girls) Clip Art Images Collection HERE. Ocean Blues Ephemera Images Kit! Graphics Fairy Premium Membership 10 Anchor Clip Art Images! 12 Vintage Children with Easter Egg Pictures! This is a beauty! Soft tints, lovely painting. Thank you! So glad you like it Peggy! Thanks so much Marci 🙂 We all use Photoshop here at The Graphics Fairy and all of our tutorials are created using Photoshop but we are not affiliated with it at all just think it is awesome and super easy to use. There are other editing software programs out there that are probably wonderful as well but I can’t personally speak to anything but Photoshop 🙂 I hope that helps!